It won’t be the sexiest hire of this weekend—you can decide for yourself whether that honor should go to Chip Kelly at UCLA or Greg Schiano at Tennessee—but the Florida Gators are reportedly finalizing a deal to hire Dan Mullen away from Mississippi State, to replace the fired Jim McElwain. Mullen, 45, was a part of two national championship teams at Florida in 2006 and 2008 as Urban Meyer’s offensive coordinator. Along with coaching quarterback Tim Tebow at Florida, Mullen also coached Kansas City Chiefs quarterback Alex Smith at Utah and Dallas Cowboys star Dak Prescott at Mississippi State. You may remember Mullen for that time he flubbed his way through an explanation of Mississippi State’s handling of five-star recruit Jeffrey Simmons, who’d been videotaped beating the hell out of woman and was subsequently suspended for one measly game. 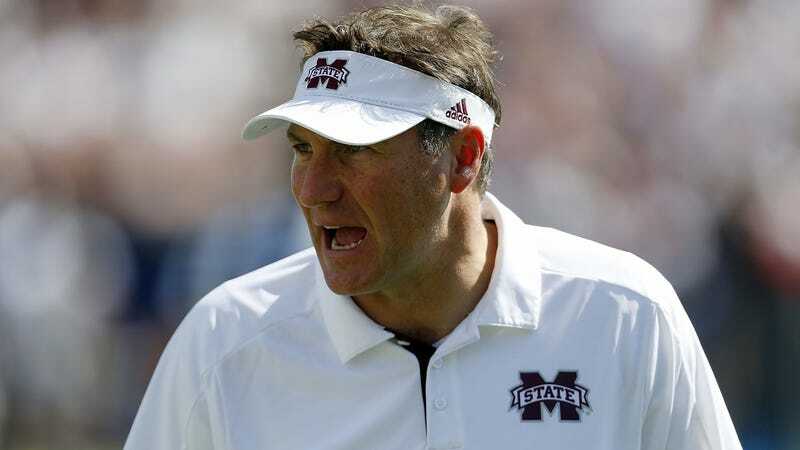 Mississippi State knows Dan Mullen is a pretty hot commodity these days and is prepared to “go all in” to try and keep him in Starkville, a source told SI Friday morning. The 45-year-old Mullen is already getting paid $4.5 million, but word is the school is willing to bump him up to around $6 million and also making an even stronger financial commitment to his staff. Mullen worked with Florida athletic director Scott Stricklin when Stricklin had the same gig in Starkville, and the prestige of Florida’s program dwarfs that of Mississippi State. The Gators were previously a finalist to land Chip Kelly, before he chose the familiarity of a return to the west coast. Now it appears they’ve arranged the triumphant return of one of their own.